Going to and Returning from Washington, 1837-.1839. Oil, 29 x 24 inches. Source: Smithsonian American Art Museum, Gift of Mrs. Joseph Harrison, Jr.
Charles Bird King, Keokuk: Chief of the Sacs and Foxes, 1838. Hand-colored lithograph, 20 1/4 x 14 1/2 inches. How does a history teacher get students to “think visually as historians” rather than merely “think visually.” I asked students to look at two 1837 portraits of Indian leaders: George Catlin’s painting Pigeon’s Egg Head (The Light) Going to and Returning from Washington, and a print based on a painting by Charles Bird King, Keokuk: Chief of the Sacs and Foxes. The exercise was part of an urban culture course, Power, Race and Culture in the U.S. City, I taught at the City College of New York in the spring of 2002 and the fall of 2003. The exercise was constructed in four stages, moving from looking and discussing initial impressions of the two portraits, to an engagement with a wider range of sources, to a final concluding discussion. 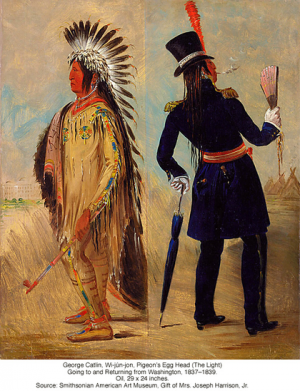 First, students were asked to examine the two portraits: “to write a paragraph or two explaining what you see.” Then they were given a series of documents, a mini-archive of more portraits, speeches by Keokuk, texts written by George Catlin or Thomas McKenney’s North American Indian Gallery where the Keokuk portrait appeared, and other documents that might help them situate the two portraits. From this mini-archive, they were asked to focus on two documents that they thought would add context and meaning to their initial reaction to the portraits, perhaps even revisiting those comments. 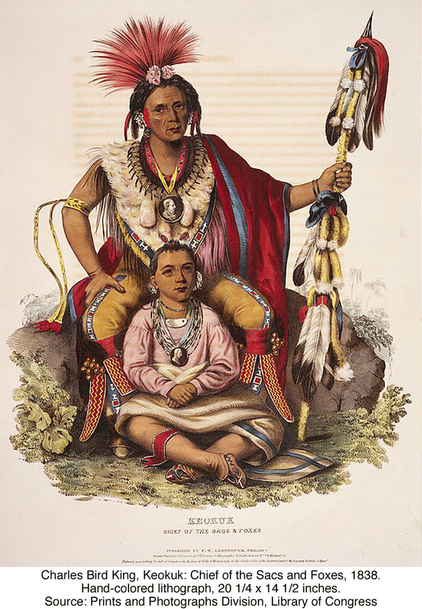 One student imaginatively reconstructed an account of Pigeon’s Egg Head’s return from Washington from the various sources, discussing how the Indian leader came back “not being Indian anymore.” This student then shifted into a formal analytic style to deal with the complex questions raised by the Keokuk portrait. By using the McKenney text, she returned to the image of Keokuk with an understanding of it as a representation of a leader who was respected by his own people but who also adopted a tactical accommodation with the American government—its doubleness remains but it is posed by specific historical actors and grounded in a particular moment. The use of a Discussion Board and students being required to post and read and respond to another student’s posting provided models for both less expert and more adept students to encounter good strategies for seeing. Clearly the structure of the exercise in yoking portraits and prose together had made the task of finding some context easier, but still the depth of that contextualization varied widely. The exercise demanded a lot from students in a short space of time. Other efforts at “scaffolding” attempted to help students make explicit links or references to historical issues. Students had made wonderful leaps about author, subject, and audience from the very beginning of the class, but they needed both more material as well as less material. I responded to the need for more by providing a series of readings or viewing guides on photography and paintings such as the essay by James Curtis, “Making Sense of Documentary Photographs” on the History Matters website, or William Cronon’s “Telling Tales on Canvas” (in Discovered Lands, Invented Pasts, ed., Jules Prown, Nancy Anderson, William Cronon, Brian Dippie [New Haven, 1992]), an exemplary account of how to read western paintings as historical narratives with a discussion of what gets included on the canvas and what remains unsaid or erased. Students need to be asked not just to add some additional images to the regular corpus, or to see images as “worthy” of being considered as historical texts, but also to “do history” by drawing on a range of sources and putting them together to construct a historical narrative.